Squeal! It’s here! TIME’S UP! This feels like my very own episode of Trading Spaces. Except I did my own room…I didn’t have a $1000 budget, and there is no Ty…or Paige….oh, and it’s not 2002. But wow, to get a room done in six weeks is no joke and I can’t wait to share my “reveal” with you! If you are just joining me, WELCOME! I have been a busy bee giving my master bedroom a sweet kick in the pants. It was a snooze before and I had given ZERO thought to the space in the five years we have been in our home. So glad this One Room Challenge was just the motivation I needed to start…and to actually (almost) finish! 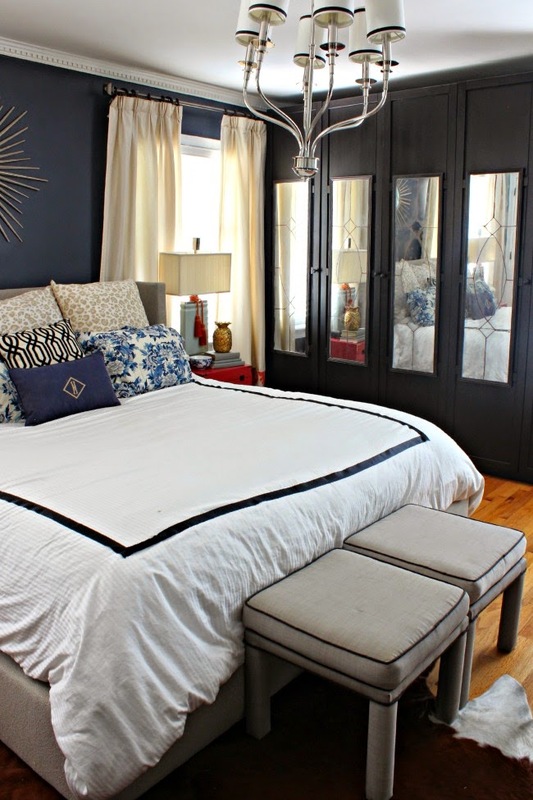 The best part of this makeover is that it was verah-verah-verah inexpensive. I do not believe that a limited budget should hold you back from having your home make you happy. This makeover is a tale of repurposing items I already had, finding a few yard sale treasures, a little elbow grease and a vision. Sadly, my fairy godmother did not show up this week and bippity-boppity-boo her way around the room to magically complete some big projects. Therefore I did not complete my lofty goal list. But that’s OK, because in my world, I NEVER call a space done. It just isn’t in my DNA. I love to constantly tweak and when the inspiration hits I know I will get ‘er done. OK, so with that (man I am feeling wordy today), I am thrilled to share the space. Can I get a low-five for getting so much knocked off the list in just six short weeks? And a up-high-five for doing it with lots of TLC, DIY, blood sweat and tears…. and very little actual moola? I must admit, I feel like a grown up when I look at this room now. Um, hello. When did I become an adult?!?!?! This week the biggie was getting the bedding squared away. For the duvet, I just added a black ribbon trim. I love the way the black border gives the duvet some ooomph. OK, now let’s just enjoy the view shall we? I will be back later to share some more of the DIY details and cost break out for inquiring minds! 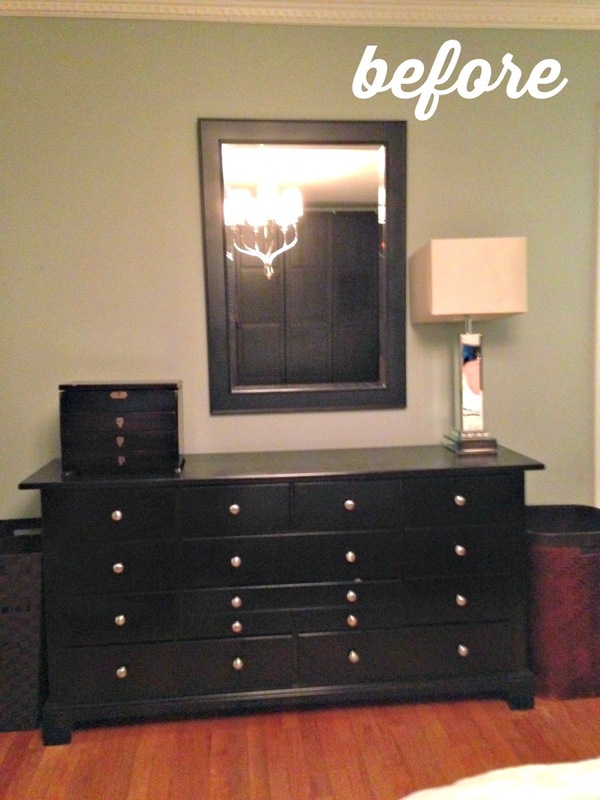 The wardrobe mirrors got a major facelift with some inexpensive door mirrors. OK, moving to the other side of the room. I will be back tomorrow with the source list and cost break-out. And because we all LOVE a good before and after, here we go just for fun! Thanks again to Linda over at Calling it Home for hosting this fun challenge! This was my first One Room Challenge and I really enjoyed having a timeline to get myself focused. Ah, who am I kidding, I have about 34 new things I have been working on around here and I can’t wait to share them all with you! This picture makes me laugh because what you don’t see is the baby crawling making a mad getaway with one shoe in his hand. « ORC Week #5- Master Bedroom – Hello Fairy Godmother, Are You There? Such a pretty transformation! Love the pops of color! Great job! The room looks fantastic Heather! Way to go…especially with two little ones to keep up with. Heather this is now such a sophisticated and chic master bedroom! Bravo I love it all! I thought it was perfectly nice before- but you have stepped it up and made it amazing! Such an eye for detail and mixing patterns. I love it! So fresh and elegant!! Amazing transformation…well done!! Wow..all I can say is it looks great! And of course I love all the blue and white! We must get to some more estate/garage sales soon! It's gorgeous! Definitely a grown up bedroom =) That mirrored wardrobe is fab! This turned out so beautifully. I love everything. Its gorgeous! 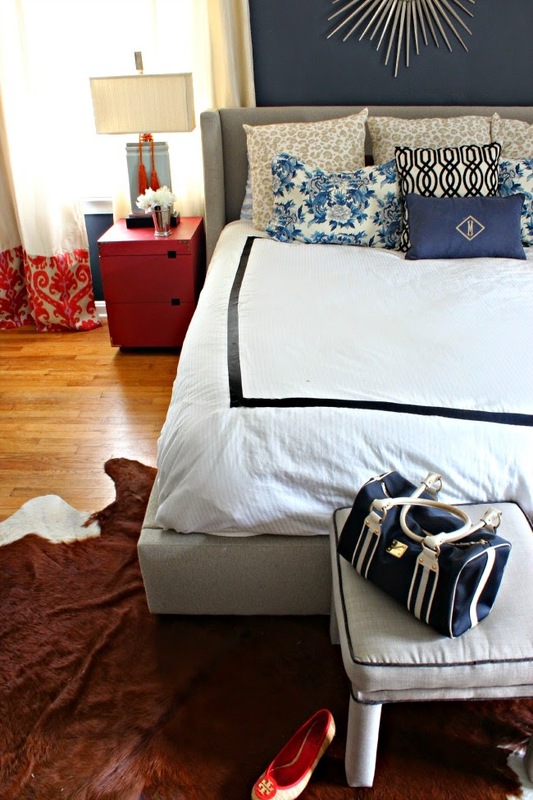 Love, love, love the cowhide, Heather and those red side tables! Great colors and details. Love it!! Nice transformation, Heather! The room looks so vibrant now! It looks so wonderful, Heather! And I love that you did it on a budget–awesome! This is truly an amazing bedroom. I just love so many things… the bedding, curtains, nightstand, dresser… you outdid yourself. Beautiful job! It looks so beautiful, and such an amazing transformation! Fantastic job! It's absolutely gorgeous! What a transformation! Heather this is beautiful. You are also funny. Love the transformation and the missing baby with missing shoe. Great job. Love the combo of blues and red and those wardrobe mirrors are just fantastic!!!! Heather, that is such a dramatic transformation! It all came together beautifully, you did such a fantastic job! Wow! I would definitely feel like a "grown-up" in this room! I am planning to use wardrobes at the back of my room, but I never thought to add mirrors to the doors to bounce around some light… Wonderful transformation! Oh my gosh Heather!!!! I love it all!!!!! The pillows the pillows the pillows – $1???????? That is so completely awesome, are you kidding me?? 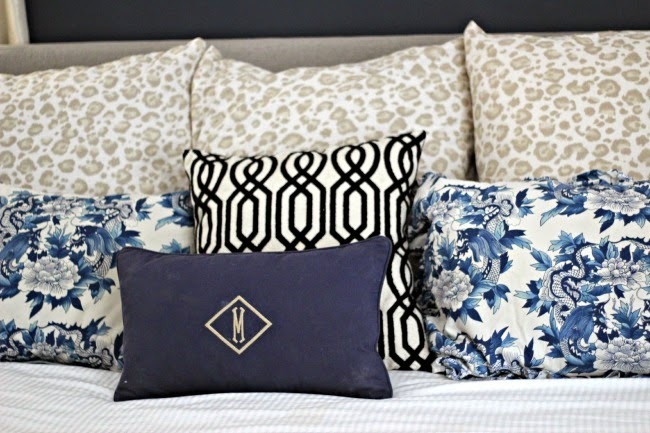 The combination of that blue & white print with the leopard and the black and white is so fresh and fun, great grouping of fabrics, and I like the bit of red you brought into this room too. Beautiful! 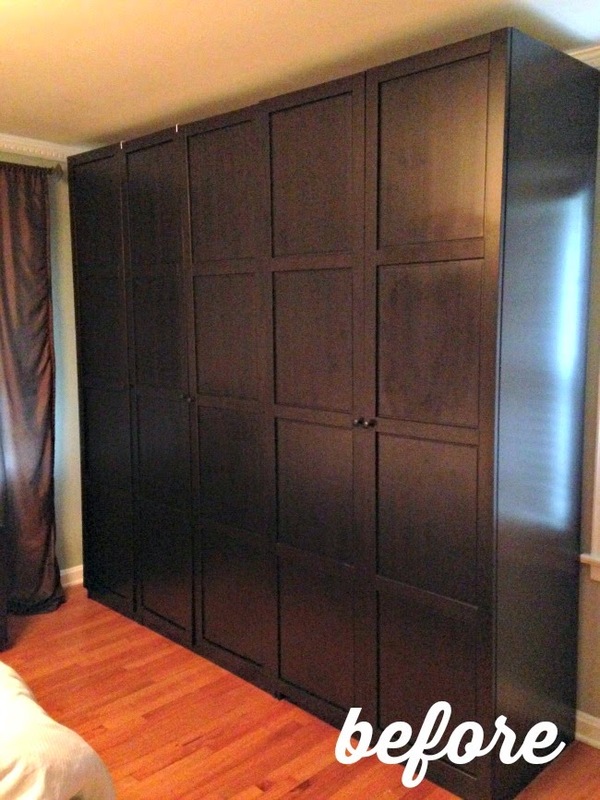 Heather – your room is stunning! 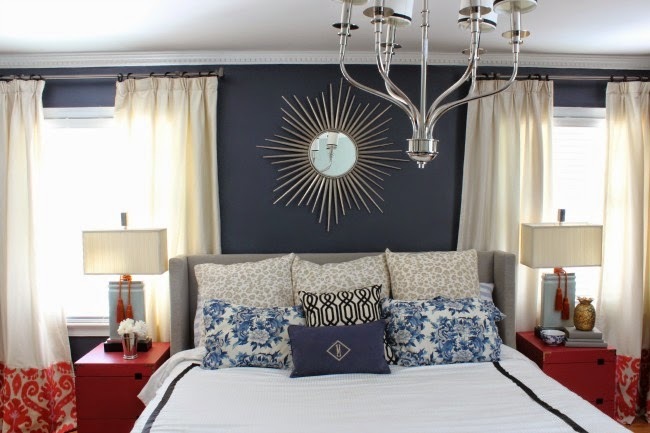 We love the navy and shades of blue – especially the wall color. We also love the textures and patterns you used. Beautiful! 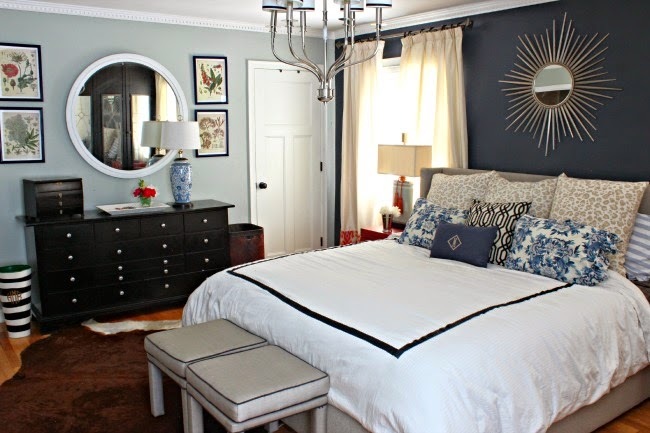 I adore you room especially the blue’s and that gorgeous mirror! What an amazing transformation, it was nice before but now its fabulous!